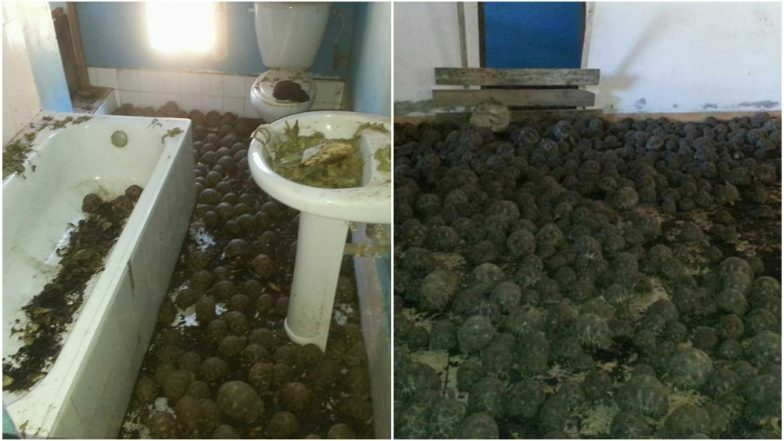 It was definitely not a pleasant surprise for Madagascar police and wildlife officials who evacuated a two-storey home in Toliara full of endangered tortoises. They were not few but more than ten thousands of them in every room of the two-storey house. From the kitchen to the bathroom, everywhere the floor was covered with critically endangered species and the rancid smell was unbearable. “You cannot imagine. It was so awful,” Soary Randrianjafizanaka, regional head of Madagascar’s environmental agency, told National Geographic. The officials are speculating a case of poaching. Zoo Knoxville in Tennessee helped in the rescue. The officials counted a total of 10,068 poached radiated tortoises. These are critically endangered tortoises which can grow up to 40cm long and weigh up to 16kg as an adult, according to the Smithsonian’s National Zoo and Conservation Biology Institute. These rare ones are found in the extreme southern and southwestern areas of Madagascar. The Turtle Survival Alliance assisted the experts for the medical care and treatment of the seized ones. But sadly a hundred of tortoises died from dehydration, malnutrition and illness. Wildlife experts said that the tortoises were being prepared to be shipped for the pet trade. The striking star pattern on the shells of these tortoises gets them a high value in the trade market. The police have arrested 3 people in connection with the smuggling. They are being interviewed to get in touch with the higher accomplice who's involved. At the time of rescue, almost 180 were found dead on the spot. The remaining rescued ones will be kept in quarantine and captivity until they’re treated and become healthy. The huge number in which the tortoises were found are scary and point to the problem of extinction of the species due to the rise in trade. “This is an overwhelming situation the Turtle Survival Alliance is dealing with. Zoo Knoxville is committed to taking action against the illegal wildlife trade that is putting so many species on the verge of extinction. We will be actively involved in supporting the TSA for the duration of this crisis,” Knoxville Zoo president and CEO Lisa New said in a statement online.